Puerto Rican cuisine may seem similar to the other Spanish Caribbean islands but it’s definitely got a signature. The Puerto Rican Adobo (dry rub) helps give roast chicken a superb flavor. We find that while it’s best to BBQ using a traditional fire pit or lump coal you can also use a skillet and oven too. 1. 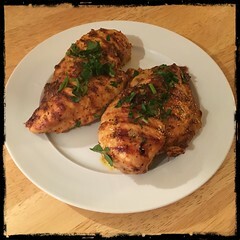 Marinate chicken in wine and olive oil for about 30-60 minutes, in the last 10 minutes add the juice of 1 lime. 2. While the chicken is marinating use a mortar and pestle to mix the garlic, Zio’s Adobo and coconut oil. 3. Remove chicken from the marinade (save the marinade) and pat dry with paper towels. 4. Rub a bit of the adobo paste onto the chicken. 5. Pan sear the chicken, remove and add more rub with some sea salt. 6. Place the pan seared chicken on bed of onions, place into preheated oven, about 350F for 30-45 minutes. 7. Top with a bit of lime juice and flat-leaf parsley. Serve with rice and beans!